Tangerine Dream helped transform contemporary music from something merely electric into something electronic, birthing a deeply technological art form. From their Berlin base, they eventually brought electronica to the masses, and their recorded legacy up to the late 1980's has influenced and continues to influence and inspire modern electronica to an enormous degree. In the 1970's, a decade that was dominated by either dinosaur rock bands or the angry energy of punk and new wave, three Germans took a gamble with a new and primitive technology - the synthesiser. Along with other key Krautrock acts of the era like Cluster, Kraftwerk and Klaus Schulze, they helped transform contemporary music from something merely electric into something electronic, birthing a deeply technological art form. From their Berlin base, Tangerine Dream eventually brought electronica to the masses, and their recorded legacy up to the late 1980's has influenced and continues to influence and inspire modern electronica to an enormous degree. The band also occupies its own unique place among the other German electronic acts of its generation. Kraftwerk's music, for instance, was all gleaming surfaces and precise rhythms inspired by the emerging technology and industrial environment of their German home. Kraftwerk's music reveals an obsession with the merging of man and machine and encoded within their sublime electropop are the roots of 80's synthpop and 90's techno. In contrast, Tangerine Dream are godfathers of psychedelic ambient and electronic trance, the latter having by the early 1990's morphed into dancefloor techno's melodic and more popular cousin. Their forte was a kind of electronic picture music informed by - amongst other things - late founder Edgar Froese's deep interest in surrealist art and the work of Salvador Dali. In the early days the band was also influenced significantly by ambient rockers Pink Floyd, but they were also listening to electronic avant-garde musicians like Karl Stockhausen and the classical composers Debussy and Wagner. And while Pink Floyd's experiments nearly always had at least some grounding in established musical forms like rock or folk, some of Tangerine Dream's early music sounded like nothing else on Earth. The band's debut album Electronic Meditation (1969) is actually nothing of the sort. It's a bizarre and now incongruous experiment in raucous "free rock" made with a conventional drum/bass/guitar line-up and various found sounds. Arguably its most notable feature is that it marks the recorded debut of Klaus Schulze, who played drums on the album but left soon afterwards for a distinguished solo career as a synthesist. Alpha Centauri (1971), Zeit (1972) and Atem (1973) are the early TD albums that really matter. Alpha Centauri sees the crucial addition Christopher Franke to the line-up, whose rhythmic sensibilities would soon move from occasional stints on live drums to a pioneering use of electronic sequencers. The cover notes to the album coin a term that's been associated with the band ever since: cosmic music. And cosmic it is, a primitive but highly evocative brand of electronic psychedelia combining organ, processed guitar and weird phrasing effects. Aside from one passage of wild drumming by Franke on "Fly And Collision Of Comas Sola", most of the music here is beatless, establishing what would become a spacemusic tradition. Recognizable rhythms are entirely absent from the next album, the double length Zeit. By this stage the band had acquired a Moog modular synthesiser and the music had taken on an even stronger other-worldly quality. The line-up of Froese, Franke and newcomer Peter Baumann had stabilised, and a clearer focus is evident throughout. It's the band's quietest, strangest, most challenging record, with one track "Birth Of Liquid Pleiades" featuring an unusual combination of synths (the Moog played by Popol Vuh's Florian Fricke) and Farfisa organ with a quartet of cellos. Tangerine Dream push their musical ideas to the abstract limits over four long, beatless ambient tracks, evoking deep space and alien landscapes with sounds sometimes completely removed from everyday notions of music. Zeit today remains a fascinating experiment in space and texture. Atem refines the ideas on Zeit into something slightly more accessible. On the lengthy title-track Franke whips up a storm on the tom-toms until the piece climaxes mid-way and dissolves into a series of eerie improvisations on mellotron, VCS-3 synth and Froese's "gliss" electric guitar. The low key mood continues through the remainder of the album until the closing "Wahn", a startling experiment with voices, echo machines and percussion. By this stage the band was now attracting considerable attention from outside Germany and after Atem they signed a recording deal with Richard Branson's Virgin Records, which had just had its first and unexpected hit with Mike Oldfield's groundbreaking Tubular Bells (1973). Branson's instincts that the band could find an audience in the UK once again proved correct; the seminal Berlin-school albums Phaedra (1974) and Rubycon (1975) were big hits. These releases find the band moving beyond the purely psychedelic influence towards a lusher, more neo-romantic-flavoured sound. They also document Franke's first extensive use of a sequencer as a means of generating rhythms and melodic pulses, a move which was to have enormous implications for both Tangerine Dream and for electronic music's move into the pop and rock mainstream. By this stage of the band's evolution actual melodies are also starting to appear, but not at the expense of the eerie and awe-inspiring atmospheres, created with clever phasing effects and beautiful melodic washes from Froese's mellotron keyboard. Phaedra and Rubycon are undisputed ambient classics, and tone-colour music of the highest quality. Stratosfear (1976) and the film soundtrack Sorcerer (1977) are an even more radical departure from the band's avant-garde roots. Almost certainly taking their cue from the commercial success of Kraftwerk's ground-breaking electropop single "Autobahn", the pulsing title-track from Stratosfear proved to be their most melodic, structured and accessible piece to date and the album cemented their new-found popularity abroad. But even here, that exquisite sense of mystery and otherness remains. Following several ordinary live albums and the departure of Peter Baumann, another transitional period suggested, somewhat worryingly, that the group was becoming a more conventional rock band. On the late-70's album Cyclone (1978), for instance, they experiment with a live drummer, vocalist and more conventional rock instrumentation with very mixed results. But soon the Kraftwerk-inspired explosion in synthesised pop really began to make its presence felt and Tangerine Dream's music moved on to its next stage. Electronic beats and sequenced rhythms were here to stay and by the end of the 70's had changed both popular and experimental music irrevocably. The technology was evolving at a rapid rate, too, and Tangerine Dream made the most of it in a huge spurt of inspired creativity that lasted until the late-80's. The band's sound had now changed quite radically from uncluttered "music of the spheres" into denser and more rhythmic ambient trance. And one could argue that this later period has been no less influential on the following generations of e-musicians and producers. While Tangerine Dream's 70's music inspired the development of more restrained styles of ambience and spacemusic, the music of their early-80's albums informed several strands of electronic dance music that first appeared in the 90's. This influence stems from the band's exquisite layering of melodies and the use of minimalistic repetition. This is ambient trance, and though it's hardly club music in itself, one can detect the roots and layered melodies of dancefloor trance and the more melodic strains of progressive house music. Check the early mix albums of progressive house DJ's like Dave Seaman and Sasha & Digweed; the music of European trance pioneers Oliver Lieb and Humate; acts from the psychedelic trance scene like Electric Universe and Astral Projection and many that followed; and the melodic meeting of techno, electro and rock that define the early albums of UK dance pioneers Orbital. Force Majeure (1979), Pergamon live (1985), Tangram (1980), Exit (1981), Logos live (1982), Poland live (1984) and the Firestarter soundtrack (1984) are the key albums of this era. This period also marks the tenure of new member Johannes Schmoelling, who joined the band in 1980 after the progressive rock-flavoured Force Majeure. With the addition of Schmoelling's fresh ideas and his sleek, gleaming sound, these albums find the nebulous and subtle qualities of the band's earlier work integrated with brighter synth arrangements, more developed rhythms and typically piercing lead guitar lines from Froese. As before, tracks of ten to twenty minutes duration are common in all their trance-inducing, multi-coloured glory. The band's sense of harmony and use of layers is thrilling: very few electronic acts past or present have been able to interlock two, three, even four spiralling melodies with such hypnotic perfection. Perhaps the crowning jewel of this period is the live recording Logos. Like all their live albums until the late 1980's it features all-new material rather than repeats of released studio recordings. It's a consistently engaging, beautifully complex and layered work. Melodic, driving rhythmic workouts coloured by odd percussion samples and digital voice bytes combine effortlessly with slower, more surreal passages of abstract sound. Even if the electro drum sound is rather leaden (something Kraftwerk always did better), Logos is still one of the most colourful and attractive pieces of pop-flavoured ambient ever released. The 40-minute title suite climaxes in a wall of rich minor and major synth chords so rapturous and sensual it simply obliterates the notion of synthesisers as soulless machines. That same euphoric quality also distinguishes the mesmerising title tracks from two otherwise mediocre albums White Eagle (1982) and Hyperborea (1983), the latter album proving to be the trio's last release on Virgin Records. Unfortunately, by the end of the 1980's, Tangerne Dream's remarkable chemistry had dissipated. Inconsistent quality from track to track already characterised quite a few of the band's albums from the the late 70's onwards; the Tangerine Dream of the 80's could be brilliant one moment, cheesy or bland the next. A slew of generic soundtracks for American films - financially lucrative work at the time - was one symptom of the decline. Then, after the wretched electropop-lite of the album Le Parc (1985), Johannes Schmoelling made the significant decision to leave for a solo career. In hindsight his contribution to Tangerine Dream was enormous, particularly in the way he applied emerging digital synth technology to bring a more streamlined and structured sensibility to the band's music without losing all the psychedelic, trippy qualities. In fairness, Schmoelling's classically-trained replacement Paul Haslinger did revitalise the band for a time before he, too, departed in 1990. Highlights of his tenure include the bright, crisp structures and gorgeous harmonic progressions of the lengthy "Song Of The Whale" suite from Underwater Sunlight (1986); the stunning electropop-classical-ambient fusion of the instrumental "Alchemy Of The Heart" from the otherwise vocal-infested Tyger (1987); and the rich, tight, pulsing film soundtrack album Miracle Mile (1989), arguably the band's last gasp of brilliance. But within a few years of Haslinger joining, key member Chris Franke - whose sequencer programming was the band's virtual engine room - left the group. Exhausted from constant touring, he was conscious of the band being overtaken by a generation of young electronic musicians with better ideas and more time to explore new tools. His exit in 1988 was a major turning point. Indeed, Tangerine Dream never recovered. "Edgar kept going with his daily routine, which in my opinion meant he had not learned anything. The chaos - which was supposed to improve - started happening again. Certain personal problems happened again, equipment problems happened again, tour chaos happened again. During my last years in Tangerine Dream, I had lost my self-respect by delivering tracks that weren't ready, creating film music that could have been done better and by giving concerts that were poorly rehearsed. To continue at this level was not worth all this stress for me." "[My departure] was part of the evolution...it was a natural process. Everything was talked over and thought over. It was a grown-up decision. It was nothing out of the blue and definitely not like a fight...now neither Edgar nor I have any regrets. We still talk and help each other." At least Franke went out on a reasonably high note: the often excellent Livemiles (1988) captures two latter-day concerts performed by the Froese-Franke-Haslinger lineup. Like previous TD live albums, all of the music is exclusive original material not on any of the studio releases, and the two epic 30 minute tracks nearly equal the best of the band's fertile 1979-1985 period. 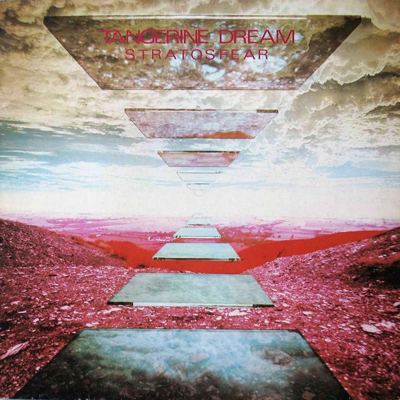 With Schmoelling, Franke and Haslinger all gone, Tangerine Dream became Froese's band alone. Joined by his son Jerome and various other sidemen in the coming decades, the band unfortunately went on to release album after album of mostly trite, throw-away synthpop or similarly bloodless instrumental electronic rock. Just how far the mighty fell can be witnessed on any number of albums released under the TD name since the late 80's, many of them pitched towards the lucrative American new age pop and adult alternative market. Coming from anyone else these albums would be competent if forgettable. But coming from Tangerine Dream they're an embarrassment to the band's legacy. The music's most distinctive traits have all but disappeared, leaving sounds indistinguishable from the electro ear candy being churned out by the current generation's more mediocre new age pop talents. Even occasional attempts at variety and new directions didn't arrest the band's decline during these years. Some albums feature straight songs with lyrics and vocals - indistinguishable from the pop mainstream - while uptempo efforts like the colourless Goblins Club (1996) are pointless attempts at updating the band's sound by messing around with elements of 90's dance music. Post-2000 releases of new material right up to Froese's death in 2015 are generally no better. Perhaps the simplest summation of the problems with the band’s latter-day output is that it "makes few utterances that cannot be heard elsewhere in [electronic] rock”, as Paul Stump so sharply observed in his band biography Digital Gothic. Jerome Froese left the band in 2006 for a solo career, and in 2011 he formed a promising new trio called Loom with former TD member Schmoelling and the Berlin-based artist Robert Waters. Of the many available compilation albums, the double album Dream Sequence (1985) is a fine snapshot of the Virgin Records years, even if it edits such epics as "Logos" and "Rubycon". Unforgivable in the minds of many fans, however, is the wrong-headedness that informs the popular Tangents 1973-83 (1994). It's only discussed here because of its bogus authorship, lest newcomers buy it in the belief that they're getting a genuine snapshot of the band's classic music. The 5-CD set from Virgin Records was assembled by Edgar Froese who - without the direct input of Baumann, Franke or Schmoelling - saw fit to remix, add to, or wholly re-record a majority of tracks on his own without clearly labeling them as such. Not surprisingly the results are uneven at best, and your reaction to the album will depend partly on whether you waxed ears on the originals first. Suffice to say that the empty spaces in tracks like "White Eagle" and "Exit" should have been left unfilled, while messing with the haunting textures of "Hyperborea" and some of the Sorcerer material proves to be a colossal error of judgement on Froese's part. On the other hand the shiny digital reworkings of early analogue synth classics like "Phaedra" sound so radically different to the originals that they qualify more as interesting cover versions than lousy remixes. Froese's revisionism doesn't stop with Tangents, either. Other Tangerine Dream compilations from the 90's onward are sprinkled with tracks that have suffered the same fate - obscuring their authorship - and similar vandalism has been performed on early Froese solo albums. Often, novice buyers can't easily tell from the album cover whether its the original recording or whether its been "tangentized" as Froese liked to call it. It's rather sad that in his later years Froese become the George Lucas of Krautrock; oblivious to criticism and unable to stop tampering with a legacy that was just fine as it is. Froese's dodgy revisionism aside, both the intrinsic value and the enduring influence of Tangerine Dream's best work should never be underestimated. Various strains of ambient electronica would be unthinkable today were it not for their artistic and technological innovations. As for their influence on modern dance music, forget any claims by techno and house snobs to the contrary i.e. Kraftwerk cool, Tangerine Dream notsomuch. This band deserves massive respect. The layered, throbbing, psychedelic creations of their peak years informed the development of several major strains of electronic club music. Never forget, either, that the history of TD parallels the history of the synthesiser. The band and synth manufacturers often worked closely together in the development and testing of new music technology. From the lounge room to the dancefloor, ask any electronic musician today who their inspirations are and Tangerine Dream is a hallowed name that pops up with hypnotic regularity. The dream may be long gone, but the legacy echoes on…and on…and on.